Despite the glorious flowers still to be found in window boxes and tubs around the town, summer is officially over: the days have been getting shorter and Thursday was the Autumn Equinox. I think all the local churches have either had their harvest festival or have it scheduled for tomorrow and the thought of harvest has reminded me once more of Spain. We didn’t pay much attention to the garden but even untended trees produce blossom and fruit as the year turns. 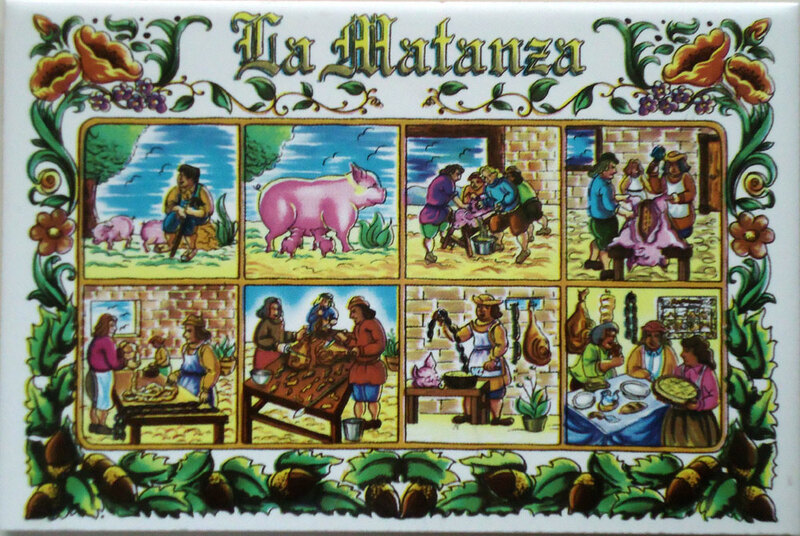 As I’ve said before on the blog (of pigs and poetry), I’ve had in mind for years now to write a poem about la matanza, but have never actually witnessed a pig slaughter. I’d just about psyched myself up to do so this year, but when the time came, the neighbour and his helpers only hobbled the pigs with ropes and then drove them away squealing. Even this tile – given me recently by a fellow poet who hoped, I think, that it would inspire me to finish the piece I took in to the writers’ group for commentary back in December – isn’t a lot of help as it doesn’t seem to show the actual killing. I was reminded of the fact I was prepared to witness a slaughter in order to be able to write about it when I was reading during my coffee break this morning. 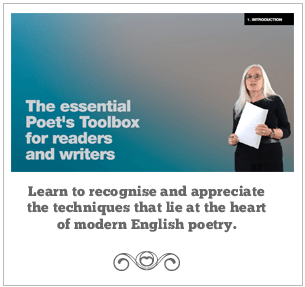 I took a new poem-in-progress into the writers’ group on Tuesday. Its title is La Matanza – the Spanish word for slaughter or massacre. It’s a piece that I’ve been intending to write ever since we bought the house in the village and were told the guy couldn’t come to prune the trees on the long December puente as he’d be busy with la matanza. 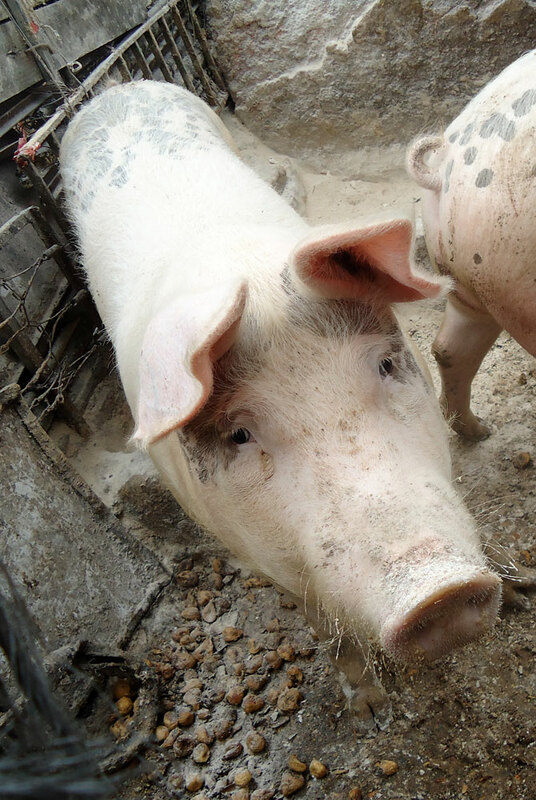 In most parts of Spain, a cada cerdo le llega su San Martín – pigs get what’s coming to them on November 11th – but it seems that in our village it’s more traditional for the pig slaughter to take place on the feast of la Inmaculada. That juxtaposition of the innocence and virginal white of the immaculate conception with the sheer red-blooded traditional country ritual of pig slaughter seems to be crying out for a poem to be written. I’ve mentioned before that there’s an old guy who keeps cerdos on the plot of land alongside the olivar. Just two pigs, each year: one for each of his daughters. I’ve started taking the windfalls across for them when I walk down to the village. When the guy isn’t there, I leave the bag by the chair where he sits each day, morning and evening, watching the pigs get fat. Sometimes one of the other viejos del pueblo joins him and they put the world to rights while the old burro grazes patiently, tethered to an olive tree. I always check the stats page to see what people are searching for that leads them to the blog. Note that I’ve not been an eye-witness, but I have heard: there has to be a pun about “pigs’ laughter” and “squealing”, but I’m leaving that for another day. Recently, though, there have been more searches for “science and technology poems”, and I think I am failing those potential readers. So I’d better do something about it (hence the post title).